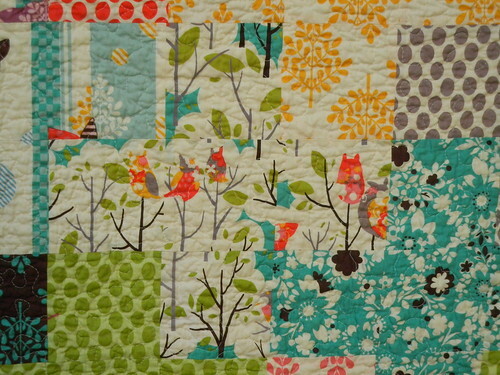 Once upon a time last fall, I positively fell in love with MoMo's fun It's a Hoot line. I quickly managed to stockpile a darn good bit of it, thanks to obsessive shopping habits and a husband who bought me some lovely fabric for Christmas. Fast-forward a few months...while I still enjoyed eyeing the fabric, I just wasn't sure what I wanted to do with it. Then, Lee announced the Supernova Quilt Along. She advised against large prints, so I hesitated about using my prized It's a Hoot stash, but ultimately, I decided to go for it. 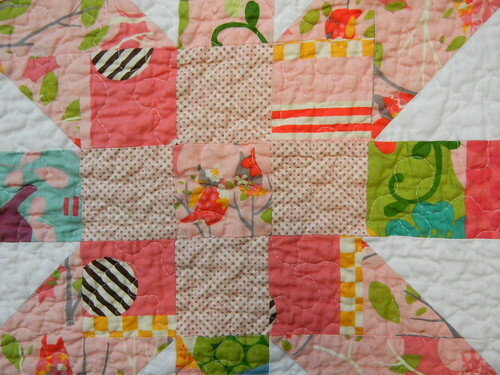 I definitely learned some things on this quilt, and not just technically speaking. 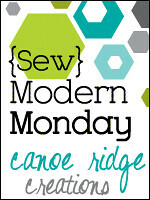 I learned (the hard way) about the importance of labeling rows whilst working on the quilt back, I learned that pressing seams open seems to lead to more accurately pieced blocks, and I learned that I have a 1/4" stitch on my sewing machine...which isn't compatible with my 1/4" piecing foot. It's something to use with my regular plain sewing foot, but it was nice to learn that. I learned to trust my instincts about fabric - even when I'm wrong. 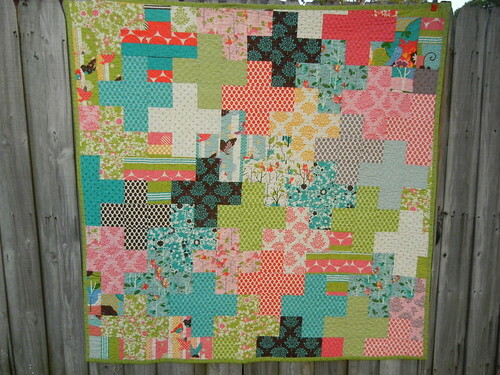 There are a few prints that look kind of unusual in this quilt, because of their large scale, but I actually kind of like that about them. Normally, I'm a big rule follower, but I guess I'm learning that when it comes to quilting, it's best to let your gut lead the way rather than the rules. I also realized something...while I love straight-line quilting and the clean look it gives, I really prefer the way a stippled quilt washes and gets all crinkly. Not only that, but I really enjoy FMQ. It's one of my favorite parts of quilting, aside from the sore shoulders it often gives me. 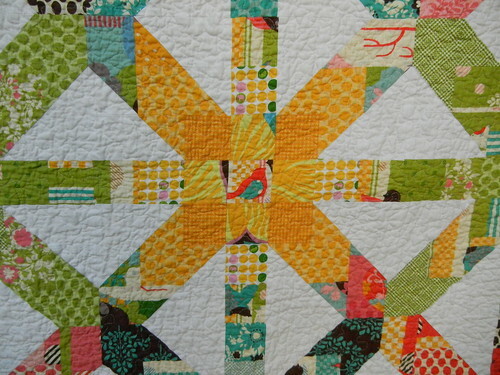 Thank you, Lee, for sharing this pattern. 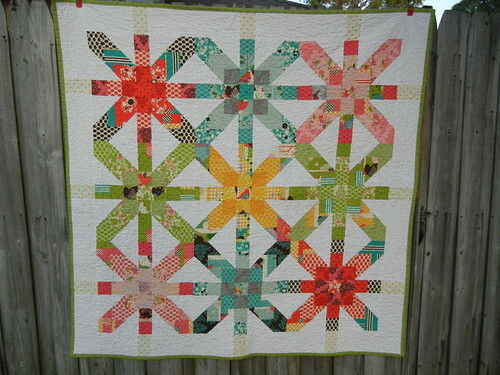 I had so much fun putting this quilt together and I'm so glad I participated in this quilt-along. If you haven't joined in yet, what are you waiting for???? Hop on over!